Want to be notified of new releases in CICM/HoaLibrary-Unity? 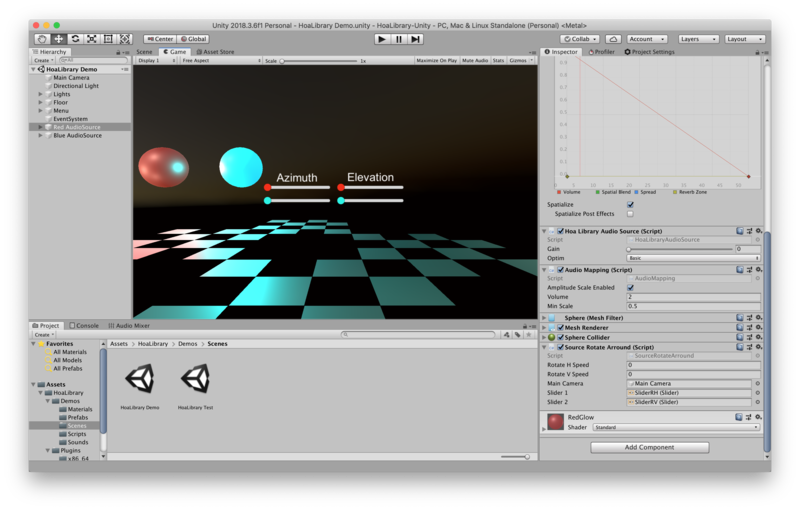 The HoaLibrary as a native unity audio plugin spatializer (supports Unity 2017.1 or newer). You can download the latest version of the package in the releases page. To install and use the plugin, please see this page. Follow the instructions below if you want to build this plugin yourself. $ cmake -G Xcode -DCMAKE_BUILD_TYPE=Release ..
$ cmake .. -G "Visual Studio 15 2017 Win64"
You should see generated plugin in /Assets/HoaLibrary/Plugins directory. Sounds included in the demo from freesound.org. HoaLibrary-Unity is under the terms of the GNU Public License. If you want to avoid the restrictions of the GPL and use HoaLibrary for a closed-source product, please contact the CICM. HoaLibrary-Max : HoaLibrary for Max. HoaLibrary-Pd : HoaLibrary for Pure Data. ofxHoa : HoaLibrary for openFrameworks. HoaLibrary-Faust : HoaLibrary for Faust. Cinder-Hoa - HoaLibrary for Cinder.